Hello every one, good morning and welcome to this section of my tutorial. 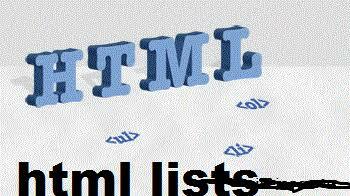 Today am gonna be talking about HTML list, am sure you all are conversant with what a list is. Without wasting much time lets go down to business. <ul> - An unordered list. This will list items using plain bullets. <ol> - An ordered list. This will use different schemes of numbers to list your items. <dl> - A definition list. This arranges your items in the same way as they are arranged in a dictionary. You can practice the above code out for better understanding and also feel free to drop your questions. You can try all the three atrribute examples out using your text editor to see the differences between them. If you are required to put your items in a numbered list instead of bulleted, then HTML ordered list will be used. This list is created using <ol> tag. The numbering starts at one and is incremented by one for each successive ordered list element tagged with <li>. <ol type="1"> - Default-case Numerals. You can try out all the type attribute examples for better understanding. <ol type="1" start="5"> - Numerals starts with 5. <ol type="I" start="5"> - Numerals starts with V.
<ol type="a" start="5"> - Letters starts with e.
HTML and XHTML supports a list style which is called the definition lists where entries are listed like in a dictionary or encyclopedia. The difinition list is the ideal way to present a glossary, list terms, or other name/value list. You can practice all the above codes out using you text editor. Well guys thats all for this tutorial, see you in my next tutorial and bye for now.